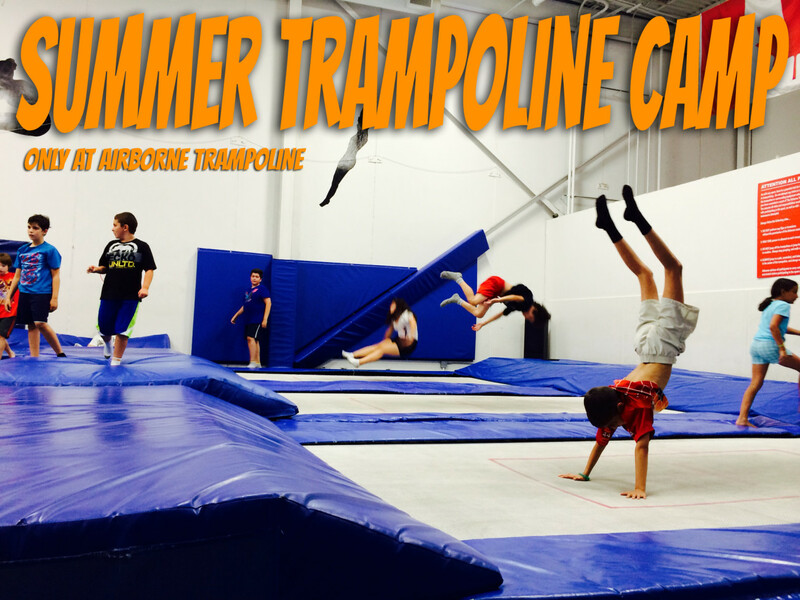 Airborne is proud to announce the the Summer Trampoline Camp is now live across all of Airborne’s locations! Airborne campers are ready to jump through summer in Airborne’s fantastic summer trampoline camp program which runs from July 3rd through August 31st. Camp programs are now taking registrations both online and by phone for daily and weekly campers. Jump in today by clicking here and selecting the location closest to you, or read on for more information on Airborne’s fantastic camp program. Trampoline Time: Since 1994 Airborne has hosted the amazing Summer Trampoline Camp program. Airborne’s camps were always based around the Olympic sport of trampoline. The Trampoline Campers are always hosted and instructed by Gymnastics Ontario certified trampoline coaches who lead the campers through trampoline lessons and skills from Airborne’s trampoline skill levels system. This system, originally designed by the Canadian Olympic Trampoline Coach, starts the campers on the basic trampoline skills and gradually progresses them upwards to more difficult skills including trampoline flips and inversions. This was laid as the core foundation of Airborne’s Trampoline Camp and has been an integral part of the program ever since. Airborne Campers are rewarded for passing their skill levels by earning an achievement ribbon to take home and show all their friends and family. New for 2018 is the inclusion of Airborne’s JumpZone Trampoline Park in the day camp program. With over 30 trampolines, trampoline dodgeball, and always supervised and hosted by Airborne’s trampoline coaches and counselors, Airborne’s jumpers are sure to get home exhausted and entertained at the end of each camp day. Camp Program: Airborne’s Trampoline Camp doesn’t ONLY focus on trampoline time. Airborne’s campers couldn’t possibly jump ALL day. That’s why Airborne integrates a fantastic program of trips and activities when the campers aren’t jumping including arts and crafts, a movie/ games room with massive 15 foot projector screen, and sports/activities hosted by Airborne’s camp counselors. Activity of the Day: Airborne’s campers always participate in a special Activity Of The Day which includes in house activities and trips to amazing venues including Dave & Busters, Bowling, Mini Golf, Karaoke, and much more! During in house activity days, Airborne campers participate in fun filled events including making slime, cotton candy, and silly putty with the scientists from Mad Science, and meeting all sorts of furry animals, creepy insects, and reptiles with the mobile petting zoo of Creepy Crawlers. Best of all, these trips and activities are always included in the camp price! Additional Options: Airborne’s Trampoline Camp has made every effort to be as accommodating as possible for our campers and their parents. Airborne understands that everyone has a different schedule and sometimes surprises pop up at both work and home. Airborne’s trampoline camp is happy to be able to offer extended hours to all campers in need starting at 8am and ending at 6pm for a minimal additional fee. Furthermore, Airborne’s Trampoline Camp offers an optional hot Pizza Lunch on every Friday of camp which includes two slices of pizza and a drink for only $5. Airborne’s Summer Trampoline Camp is excited to be entering its 24th year of operation. for more information or to register online, click HERE and choose the location closest to you to begin your amazing trampoline camp adventure! ← Why is Airborne Trampoline Special?